For the past few years I have watched lovely ladies like Jaana, Andrea and Caroline complete 10x10 challenges, wherein 10 pieces from their wardrobes are selected and styled into 10 outfits over 10 days. I have always loved watching these smart and stylish women tackle such a seemingly restrictive challenge with immense creativity and gusto. It's been a joy watching as their participation inevitably revealed something to them about their own style preferences, or caused them to rekindle an affinity for pieces they already owned. At a time of year where resolutions are rampant, and cleaning up and clearing out yesteryear's clutter is on everyone's list, this challenge is a perfect excuse to take a hard look at my closet and remind myself how I truly don't need anymore clothes. Doing more with less is (and continues to be) a personal goal of mine in 2017, and so without further ado, here is what I plan to work with over the next ten days. In case you're not already in the know, Lee of Style Bee and Caroline of UnFancy are hosting a winter 10x10 remix and today marks the first day. 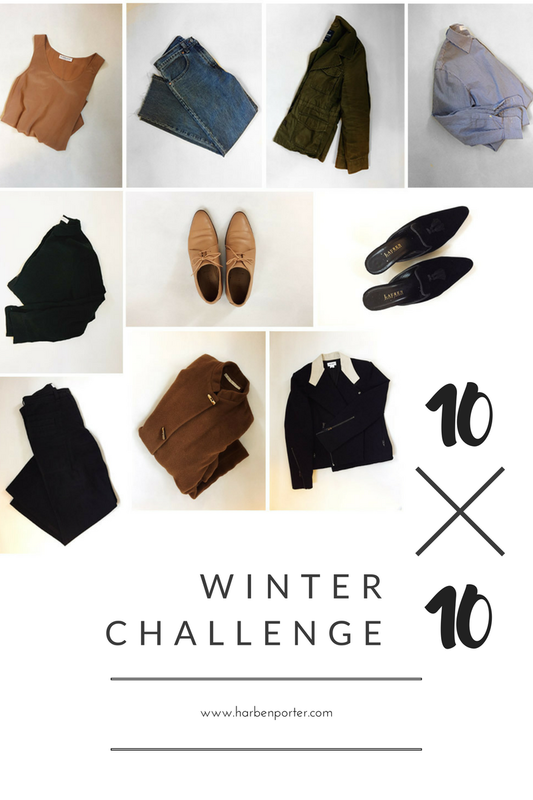 The 10 x 10 challenge is designed to encourage creativity, resourcefulness, and clarity through discernment and selectivity - it's essentially a little mini capsule wardrobe exercise. On steroids. CREATIVITY: When I first began preparing for this challenge I reached for only my most favorite pieces before reconsidering the intention and purpose of a 10 x 10 remix. If this isn't the time to play around with some of my more questionable pieces, then when is? Through this challenge I hope to apply creativity to my looks and outfit combinations, and perhaps reconsider a few of the lesser worn pieces hanging in my closet. RESOURCEFULNESS: I hope to view what I own with fresh eyes and get crafty with aesthetic, design, and functionality. I've recently noticed that I'm teetering toward uniform territory with a lot of my looks. This challenge presents an opportunity to intentionally shake things up and figure out if I'm uniforming out of true love and clarity or a lack of creativity. CLARITY: This is the big one, right? We (women in particular) are constantly bombarded with style-centric messaging, be it from direct media, advertising, Instagram, or blogs, not to mention the million little hidden ways we're marketed to. It doesn't take much for a desire to replicate something we've seen somewhere else muddy our own style clarity. I mentioned in my end-of-year review that I had accumulated far too many new pieces of clothing in 2016, and I think that in part my additions were representative of my chasing someone else's style. I got caught up trying to replicate what I liked on others, instead of focusing on what made me feel my best. That's not to say that you shouldn't allow yourself to be inspired by what you see or consume, but be careful not to let the wanting dominate. I'm really writing this as a reminder to myself. My hope is that this 10 x 10 challenge will help me curtail my wandering eye and rekindle the love I have for what I already own by highlighting my truest personal style. In addition to those bucket areas, I also considered weather, events I have lined up, and what outfits my frequently visited settings call for. I'm lucky in that my office environment is casual enough to get away with wearing raw hem jeans, but no one scoffs at trousers, even of the wide leg variety. To help organize my thoughts around this challenge I will be posting my first five outfits this Friday, with the second five debuted the following Thursday. You can follow along on Instagram for daily outfit updates (I promise I'll really wear the pieces I've chosen! ), and then finish up with a recap of the whole experience the third week of January. How's that for accountability? Lastly, if you're feeling up for the challenge, please join in! There are a few hashtags that people are using to bring participants together (try #winter10x10) so go forth and connect with your fellow style enthusiasts! When I first moved to San Francisco I noticed something almost immediately: everyone and their mother owned a Marc Jacobs black crossbody leather purse. Often styled with North Face jackets and skinny jeans, the Jacobs bag was a mainstay for many a Northern California gal. As a full-time graduate student, nonprofit administrator, and as someone who had yet to be exposed to the world of ethical fashion, I went ahead a followed suit and bought myself the less expensive vinyl version of the purse so many touted. It lasted approximately five wears before the seams started falling apart. And this from an expensive, designer bag. I was as crushed as my bank account was deflated.